Why not decide to travel without sacrificing on convenience whilst also making a saving on the cost? Enjoy your well-deserved holiday right from the very first moment by choosing the ease and convenience of the Disneyland Shuttle Service. 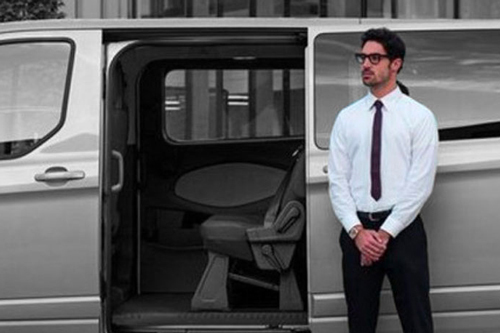 By booking a shared shuttle service: you can travel without worrying right to your final destination. How does the service that is offered on this page actually operate? The shuttle service is a people carrier with 8 seats and a driver who collects the passengers from Beauvais Airport and delivers them to their accommodation at Disneyland Paris. For families travelling with children, the savings are even greater because, the more people there are, the lower the transport costs will be and the children's car seats are always included in the price. What is the easiest way to reach your accommodation in Disneyland? By booking a shared shuttle service and: you will have a driver waiting for you at the airport who will deliver you to your accommodation in the wonderful world of Disney. Forget about worrying over the suitcases and uncomfortable journeys that are too long for the children: share your journey with other travellers (up to a maximum of 8 people) and save on the costs without sacrificing on comfort or convenience. Beauvais Tillé Airport which is located in the small municipality of Tillé, is around 115 kilometres from the French capital and about 130 kilometres from Disneyland Paris. In fact, the famous Disney amusement park is in Marne la Vallée. Transport connections from Beauvais Airport to the theme park are numerous, however, if you want to travel in a relaxed fashion with your family, it is recommended to book a means of transport that will take you from the airport straight to your accommodation without any changes or stops in the middle of your journey. This is all possible with a private taxi service or with a shared shuttle service which you are able to book on this page. The average duration of the transfer with the shared shuttle is around two hours. The travelling time is based on the number of kilometres and the ever present volumes of traffic on the French motorways. However, in any event, the driver will always calculate the best route to guarantee his passengers a pleasant journey that is as short as possible. The strong point of our transport services is the guarantee of a fixed price at the time of booking that will not change later due to the actual duration of the journey. The airport shuttle is operative every day, including public holidays from 05:00 to 21:30 hours. The departures are generally around 30 minutes after the arrival of your flight and your driver will be waiting for you right inside the airport, in front of the information point in the arrivals hall of your terminal. At the time of booking the return transfer: it will be necessary to request the pick-up (from your accommodation at Disneyland Paris) allowing at least 4 hours prior to the departure time of your flight. Although this may seem excessive, this timing is calculated taking the level of traffic in the city into consideration, how busy the airport tends to be and any possible delays caused by other passengers. If you abide by the 4 hours in advance, you will travel without any worries and with no anxieties about the possibility of missing your return flight. In order to book this shared shuttle service, you just need to fill in the form on this page: you will need to provide the pick-up time, the airport at which you are arriving, the ultimate destination with the full address and post code and the flight number. If you are also intending to book the return flight with a corresponding discount, you simply have to mark the box showing "I want a return journey," and in this case, you will also need to advise the pick-up time, the airport from which you are departing, the destination (including the address and post code) and the flight number. Why do we ask for the flight number? The flight number is imperative in order to ensure the best possible service in the event of any delays or cancellations. The form will automatically provide the costs for each passenger straight away. The more people there are travelling with you, the cheaper the transfer becomes. Children are charged the same fee as adults but, the children's car seats are always included in the price. In order to confirm the booking, a small deposit is required which is payable by credit or debit card. The final payment will be made to the driver, in cash. Please select 2nd Transfer 1pass. 62€ 2pass. 77€ 3pass. 88€ 4pass. 96€ 5pass. 114€ 6pass. 120€ 7pass. 127€ 8pass. 134€ Over 9: book a private taxi on Taxileader.net Passengers?